The word "brilliant" comes to mind. When it comes to late harvest wines in America, Dolce stands at the pinnacle: a honeyed wine, ripe with aromas of apricot and orange rind, capable of aging and evolving for years to come. Dolce starts in the vineyard, when just the right elements--nature, craftsmanship and a little luck--come together to produce a wine that is truly a triumph over adversity. The double magnum (3L) bottle is sealed in hand-dipped wax and presented in a stunning, lacquered box. 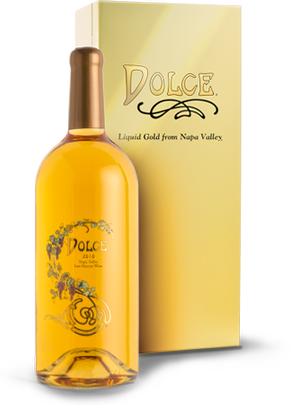 The 2010 Dolce offers predominant aromas of butterscotch and dried apricots enriched with subtle notes of nutmeg and caramel. Flavors of stone fruit, mostly apricot and peach, mingle with honeysuckle and the caramel character promised by the aroma. This wine’s sweetness is in balance with a mouthwatering acidity and its silky texture is present from the coating entry to its smooth and lengthy finish. This wine is concentrated with fruit flavors but its youthful expression is expected to develop inviting bakery aromas over time—warm brioche and crème brûlée descriptors are becoming evident already.